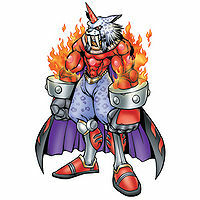 A member of the enigmatic "Olympos XII", it is a Digimon god of war with the appearance of a panther-man. The Olympos XII lie in the shadows and possess ability rivaling that of the guardian deities of the Net, the "Royal Knights", and each protects its own domain while maintaining a position of neutrality regarding the incidents which arise in the Digital World. Marsmon is well-versed in all sorts of combat techniques known throughout the world, including underhanded techniques, and has absolute confidence in battles against others in the same weight class. 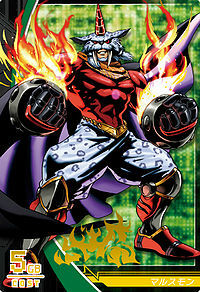 While Marsmon typically uses wrestling techniques, it is so fixated on victory and glory that when push comes to shove, it will not hesitate to use concealed weapons such as its "Tria Knuckle" or "Metal Cothurnus". However, its true power is exhibited when it uses its bare hands and feet. 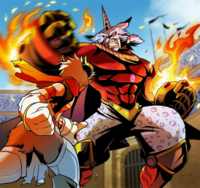 Its Special Move is a magnificent aerial assault performed while clad in flames (Corona Sanctions). Title: 「軍神」 — "God of War"
| Mars (「マルス」 Marusu) was the god of war in Roman Mythology. | Berserk (「ベルセルク」 Beruseruku) were champion Norse fierce warriors who were known for battling in an uncontrollable, trance-like fury, and were alleged to be able to perform seemingly impossible super-human feats of strength. In medieval Norse and Germanic history and folklore, the berserkers were described as members of an unruly warrior gang that worshipped Odin, the supreme Norse deity. Marusu is a romanization of マルス. 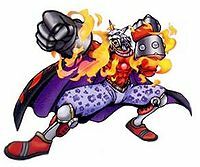 Anime/Manga Digimon Xros Wars: "The Final Kingdom, The Shining Sun's Bright Land"
Attacks with a magnificent aerial assault while clad in flames. 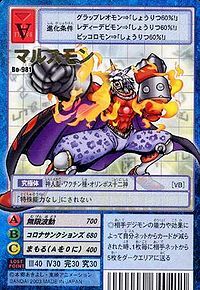 Mugen Hadou  Endless Surge 無限波動 N/A Mugenhadou A combo of punches followed by a pillar of fire, or a shock wave fired from its hands. Shinkuu Hou  Vacuum Cannon しんくうほう N/A Vacuum Cannon A series of punches and kicks that generate a damaging vacuum of wind. Marshals its qi for the next blow. Marsmon was a member of the Bagra Army, serving under Apollomon in Bright Land. After the initial confrontation with Xros Heart, he guided them through Apollomon's tower. He was later executed by Whispered for his role in the attempted rebellion (which Apollomon had been secretly planning (or so he thought)) against Bagramon. 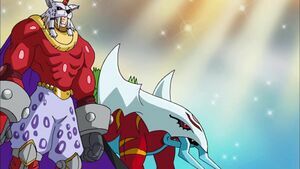 He was revived during the final battle against DarknessBagramon and became part of Shoutmon X7 Superior Mode. Marsmon appears in a flashback of Mogami Ryouma. 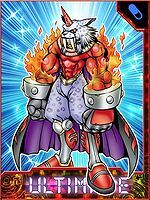 Marsmon is the natural Ultimate form of the Bearmon line. 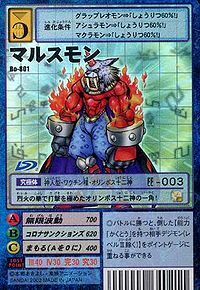 It evolves from Bearmon at level 40, or from Grappu Leomon at level 99 if not a Bearmon. 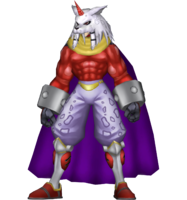 It can evolve to Devimon at level 10, Growmon at level 20 with 480 Strength, and Stingmon at level 30 with 400 Speed. Its finishing technique is Mugenhadou, a physical move which it learns at level 85. 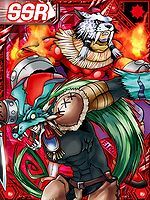 The Marsmon card is #148 and is a green Ultimate card with 55/55 stats. 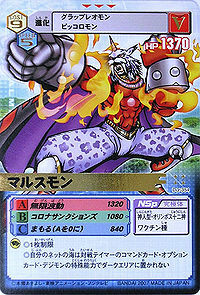 It appears in the 9b, 11b, 13a, 14a, and R-05 booster packs. 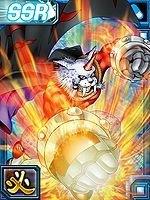 Marsmon is an available Burst Mode Evolution for Bancho Leomon. It can be unlocked if level 70 or above with the item Tria Knuckle. 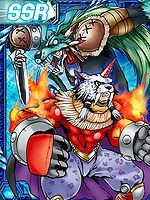 Marsmon can only be obtained as a collectible card. 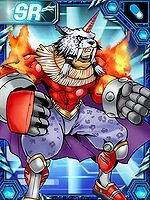 Marsmon is available as a Digimon Medal. 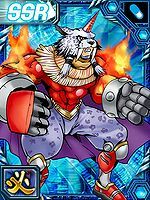 A member of the Olympos XII who has perfected striking techniques with its fiery fists! 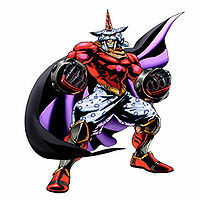 A member of the Olympos XII, it is a war god who has acquired all combat techniques, even including underhanded ones. It mainly fights through wrestling, and holds great confidence in its abilities in one-on-one battles. 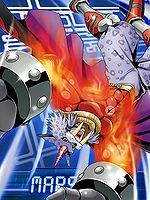 ↑ Digimon Fusion: "Dark Side Of The Sun"
↑ Marsmon's initial design was retouched by αρχιμεδεｓ. This page was last modified on 9 April 2019, at 18:21.